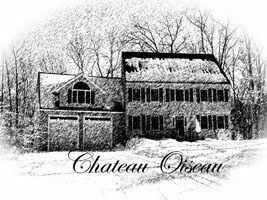 Chateau Oiseau: The fun begins! 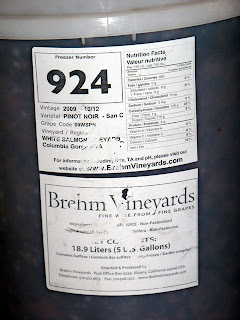 Well, today was the big day...my pinot noir grapes arrived from Brehm Vineyards as cargo on a Southwest Airlines flight from California. 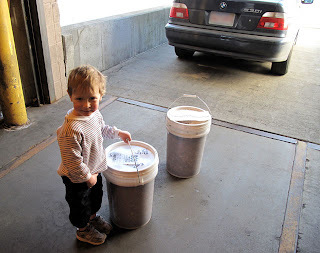 My 3 year old son Léon and I drove down to Logan and picked up the two 6 gallon buckets, still mostly frozen, and tossed them in the beemer. They fit nicely in the trunk. Then we drove home. Now they are thawing as I prepare my strategy. 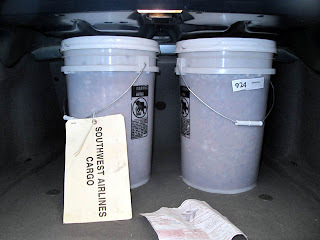 It's 16 degrees outside today...a bit late in the season for pinot noir, but due to the miracles of flash freezing and modern aircraft, I can make a wine from WA grapes in the dead of winter in Massachusetts! For Christmas, my lovely wife bought me a nice "deluxe" winemaking kit from Winemaker's Depot. This kit has all the basic stuff you need to get started, although it is missing a few key items that need to be purchased separately (to be discussed later). Also, it is based around the premise that the person using it will be making wine from a juice kit. (ugh) So the fermenter is pretty small (8 gallons) and won't handle my 10+ gallons of must. As a result, yesterday included a trip to Wal-mart for a nice big plastic rubbermaid "tote" to serve as a fermenter for my pinot must. By the way, I'm using two highly rated books as my background info for this project. Jon Iverson's Home Winemaking, and Northern Wineworks, a book about growing grapes and making wine in cold climates. Both are interesting reads and have given me a great background to begin this undertaking!